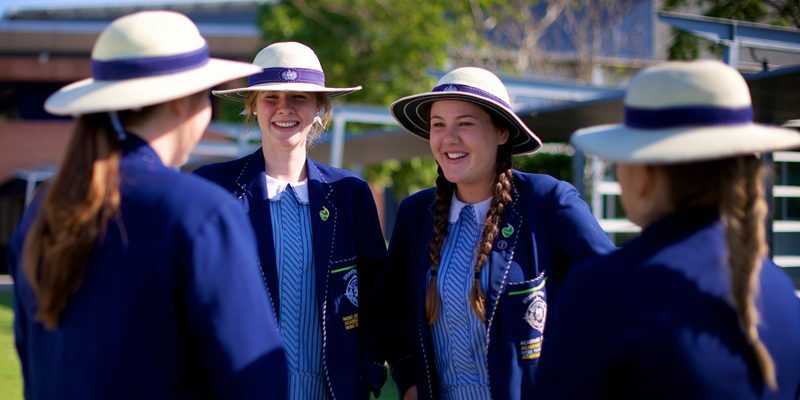 From when they first commence at Stuartholme, students are provided decision making and leadership opportunities. As each girl finds her way through school and identifies her own strengths, broader and more challenging leadership opportunities become available. As the girls develop, they are expected to show initiative, lead by example, and be an inspiration to others; giving expression to the Goals of Sacred Heart Education. Each student has the opportunity to nominate, and be nominated for various leadership positions, including: Blue and Green Ribbons; House and Boarding Captains, the Student Representative Council and Cor Unum Committee. The Cor Unum Committee are a group of four Year 12 students who promote the Sacred Heart Goal of Building Community as a Christian Value. Guided by the Dean of Student Wellbeing, the Cor Unum Committee are often required to represent the school at official functions, lead school assemblies and foster school spirit among their peers. Girls have many opportunities to develop their leadership skills and participate in meaningful community service projects both at school and in the wider community.